Unique Moments Photography of Gig Harbor Washington traveled to Arlington to capture this very special wedding. Life is fragile and it can change at the blink of an eye. This little guy is a special young man. He was born with a defective heart which required a heart transplant. His story and the parents are simply remarkable. Needless to say, the wedding was placed on hold while little guy made a full and complete recovery. We loved the image of dad and our special ring bearer. The room was cluttered, everyone was running around trying to get ready for the first look, Mom was getting into the dress. No Big deal. Minor distractions. This little guy needed to get his suit and tie on and he stepped right up and mixed it up with the guys in the dressing area. We see this at every wedding. Guys trying to figure out how to put the tie on, how does the cuff link go on, what side for the flowers. But this one was a little different and it was special. 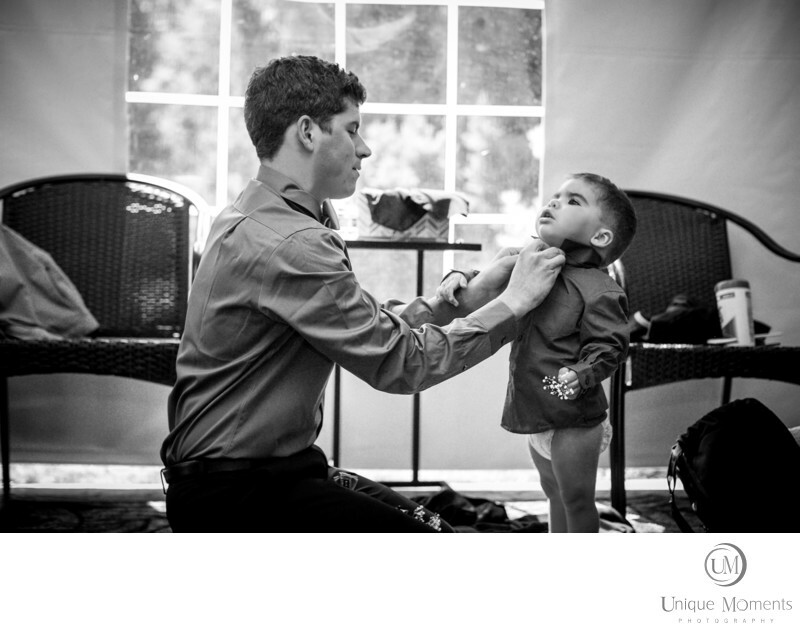 Dad adjusting the ring bearer's tie. All the hustle and bustle that goes on during the first part of the wedding day didn't matter at all. This family has seen distractions. This was a time to relax and just enjoy what is really important in life. We were very Honored to hear this young mans remarkable story and to be part of this wedding at natures connection place. It seems like every other year we come across some remarkable stories with families that have overcome life's Road Blocks to celebrate what is really important in life with a wedding Ceremony. This was one of those very special weddings. A Great day indeed.